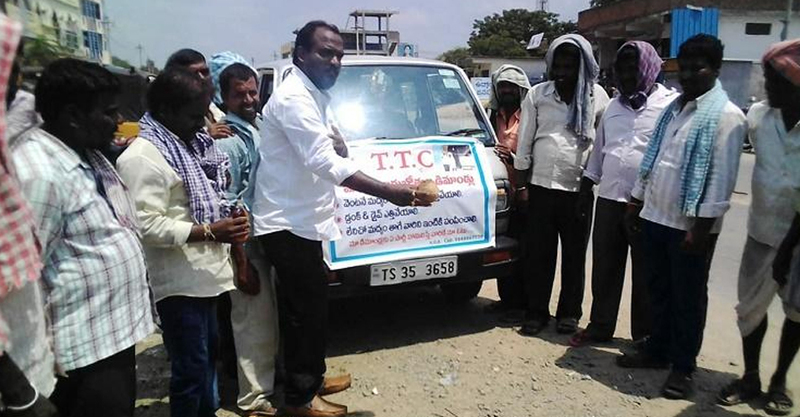 Tipplers at Jangmrayi village in Medak district have a new ‘saviour’. They can now not only get drunk at their local wine shops till the shutters are down, but can also get dropped back home, safe and without fearing the police. The man they can thank is Avula Gopala Reddy, a local politician, who has started a new ambulance service to ferry those too drunk to ride or drive home. The exclusive service is not only available at any time of the day but Gopala Reddy plans to not charge a single paisa for the ambulance ride home. Gopala, referred to as ‘108 service’ among the villagers in Jangmrayi, is an active politician and also a social activist. He had formally launched the facility at Chinna Sankarampet town on September 11 after performing a puja. But his ambulance service, which is hardly a month-old, has many patrons already. “Before I began the service, I used to lend my car to people in need and also convert my vehicle into an emergency ambulance. But now I have hired a driver to ferry drunkards as and when we receive calls from wine shops,” Gopala says. On being asked what prompted him to start such a unique service, he says that it is to prevent people from getting caught by police for drunken driving and to avoid accidents. “Whoever needs our service can make a call to 9848867779 from the permit rooms in the wines shops or bars. I will send my vehicle along with the driver who will safely drop them at their homes without charging a single rupee,” he explains. While his initiative may be a lifesaver for many in Jangmrayi, Gopala says that neither has he ever consumed alcohol in his life nor by any means does he advocate drinking. He incidentally floated the Telangana Tagubothula Committee (TTC) or Committee for Telangana Boozers to express his solidarity with tipplers. But it’s the government that Gopala is really taking a dig at, questioning their policies and urging them to crackdown on alcoholism. “The government themselves have opened bars and wine shops and promote liquor consumption in order to generate revenue. And when people get drunk at the same wine shops and bars, they need to fear for their money and life as the same government imposes fine on them for drunken driving,” reasons Gopala. In order to stop drunken driving, the government has power and must impose certain regulations. “Firstly, the permit rooms in the bars should be shut so that people would not sit at bars and consume alcohol till late night. Secondly, the shops should stop serving alcohol by 6pm so that people would grab a bottle and drink only inside their homes,” says the former Zilla Parishad member. Thirdly, he says that government should stop imposing penalties on people for drunken driving. “If the government is really concerned about their safety, they should stop collecting fines from them. Such people are caught by the police, who then conduct breath analyzing tests and impose heavy penalties on them, ranging from Rs 1,000 to Rs 3,000, and are at times also sent to jail. Instead, police should provide shelter to such people. They should be put up in the police stations and then let go off in the morning. Otherwise, they should make transport arrangements for them to reach their homes safely,” he argues. So from where does the money for his initiative come from? Gopala says he has saved enough and is also earning well in order to support the initiative. The Maruti Omni van, which operates as the ambulance, can ferry at the most 10 people at a time, he says. Gopala also dismisses the chance of people criticising his initiative. “People, including my family have been quite supportive of the idea. Even though it has been less than a month since we began the service, people are clearly loving it and a lot of people avail the service throughout the day,” he adds.